Duke University is an institution with the ambition and boldness to make a global impact in our new century. The student-driven campus is located in the heart of one of America’s most fascinating and vibrant areas: the city of Durham in North Carolina’s Research Triangle region. There’s no limit to what you can do as a student at Duke—and our extraordinary campus is just your first stop. Duke Libraries, one of the nation’s top 10 private research library systems, comprises six libraries across East and West Campuses, including the Rubenstein Rare Book & Manuscript Library and the separately administered libraries serving the Schools of Business, Divinity, Law, and Medicine. SARAH P. DUKE GARDENS are 55 acres of landscaped and woodland gardens in the heart of Duke’s West Campus. Each year, more than 300,000 visitors enjoy the gardens’ five miles of walkways and more than 8,000 species and varieties of plants. THE NASHER MUSEUM OF ART opened in 2005 and is a major center for the arts on campus. The museum serves the University, Research Triangle, and surrounding region with an ambitious schedule of exhibitions and educational programs. THE MARINE LABORATORY in coastal Beaufort, North Carolina, is a residential campus directed by Duke’s Nicholas School of the Environment. Research is conducted in basic ocean processes, coastal environment management, marine biotechnology, and marine biomedicine. THE DUKE SMART HOME is a research-based approach to smart living sponsored by the Pratt School of Engineering. Primarily focused on undergraduates, the program encourages students from different academic disciplines to form teams and explore smart ways to use technology in the home. THE FITZPATRICK CENTER FOR INTERDISCIPLINARY ENGINEERING, MEDICINE, AND APPLIED SCIENCES was built to emphasize interdisciplinary activities and encourage cross-departmental interactions. Research facilities focus on photonics, bioengineering, communications, and materials science and engineering. DUKE FOREST covers 7,200 acres in separate areas of Durham and nearby counties and serves as a natural outdoor laboratory for Duke and neighboring universities. The forest is used for research, protecting wildlife and rare plant species, and studying timber management practices. It’s also a popular place to walk or run. THE RICHARD H. BRODHEAD CENTER FOR CAMPUS LIFE, which opened in fall 2006, is a gathering spot for informal meetings, relaxing, dining, and enjoying artistic performances. DUKE LEMUR CENTER is home to the world’s largest colony of endangered primates, including more than 200 lemurs, bush babies, and lorises. 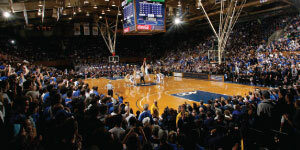 CAMERON INDOOR STADIUM is considered the crown jewel of college basketball. Cameron was renovated in the late 1980s and underwent a series of improvements in 2009 to enhance the game-day experience. DUKE PERFORMANCES hosts 60–70 professional performing arts events each year, including music, theater, dance, and talks on campus. Many events are held in Page Auditorium, with others held at Reynolds Industries Theater, Baldwin Auditorium, the Nelson Music Room, and other venues. DUKE UNIVERSITY PRESS publishes about 120 new books each year as well as more than 30 scholarly journals. The publications are mainly in the humanities and social sciences, but some cover aspects of law, medicine, the sciences, and mathematics. 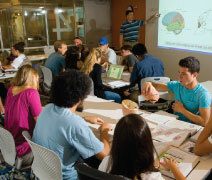 BRYAN CENTER is the hub of student activity. It serves as an expanded student union and contains theaters, restaurants, a coffeehouse, book and merchandise stores, an information desk, a post office, and more. DUKE CHAPEL, an iconic symbol of the University, is at the center of the Gothic West Campus. Built in 1932, the chapel is dominated by a 210-foot tower housing a 50-bell carillon, which is played at the end of each workday. MARY LOU WILLIAMS CENTER FOR BLACK CULTURE, established in 1983, features an art gallery, performing space, library, and lounge and sponsors speakers and events on race, ethnicity, and social difference. PAGE AUDITORIUM is Duke’s largest theater, with a capacity of 1,200 seats. It has been the site of thousands of performances and lectures since its opening in 1930, including speeches by Senator John F. Kennedy and the Reverend Martin Luther King Jr.
DUKE SPORTS HALL OF FAME showcases all of Duke’s teams in a public museum featuring video, audio, trophy cases, and a theater. Duke University is an institution with the ambition and boldness to make a global impact in our new century. The student-driven campus is located in the heart of one of America’s most fascinating and vibrant areas: the city of Durham in North Carolina’s Research Triangle region. With a unique cultural identity, this medium-sized city is known for its innovative research, nationally recognized cuisine, rich history, and vibrant arts community. As diverse and creative as their community, Duke students embrace learning and collaboration through an impressive range of academic, cultural, and service experiences. Students who aspire to a Duke education tend to be ambitious, curious students who pursue challenges, are unafraid to question convention, and seek out innovation. With over 50 million possible paths through our curriculum, Duke provides limitless intellectual opportunity for our students to develop their minds and enrich themselves as individuals. Through programs like Focus and Bass Connections, Duke provides every undergraduate ready access to faculty, research, independent study, and service and learning opportunities around the world. We encourage students to explore all of their interests—almost 85% of Duke students graduate with more than a single major, and our 23 multidisciplinary certificates are particularly popular options. Wide-ranging, proactive support services assist students in their academic pursuits, including pre-professional and career advising. While they are engaged with their course work, Duke students also have plenty of space for imagination and exploration through service and study abroad opportunities. DukeEngage, a fully funded, immersive summer service program, allows students to address critical human needs and provide meaningful assistance to communities in the US and abroad. Each year, students participate in a variety of civic engagement activities such as environmental advocacy, community outreach, global health, education, social entrepreneurship, and more. A private institution tracing its roots to 1838, Duke enrolls approximately 7,000 undergraduate and 8,900 graduate and professional students who represent every state in the nation and over 80 countries around the world. The University continues to evolve in response to the changing needs of the world its graduates serve. Duke’s home campus in Durham, North Carolina, a city of more than 270,000 people, comprises 256 buildings on 8,532 acres, including 7,044 acres of Duke Forest (see sidebar). The campus is divided into four main areas: West, East, and Central campuses and the Medical Center, which are all connected via a free bus service. 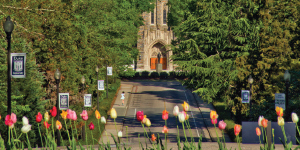 Duke students often refer to the campus as the “Gothic Wonderland,” a nickname referring to the Collegiate Gothic architecture of West Campus. Much of the campus was designed by Julian Abele, one of the first prominent African American architects. In 2016, Travel + Leisure listed Duke among the most beautiful college campuses in the United States. Duke requires its students to live on campus for the first three years of undergraduate life, fostering a close-knit campus community. Accordingly, approximately 82% of undergraduates live on campus in housing that caters to students’ many varied interests, from learning communities to first-year student clusters. All housing on West and Central is organized into about 80 “houses”—sections of residence halls or clusters of apartments, each with its own unique identity—to which students can return each year. More than 500 clubs and organizations spanning all manner of student passions, talents, and cultural backgrounds operate on Duke’s campus. These include numerous student government, special-interest, and service organizations. More than 75% of Duke students pursue service learning opportunities in Durham and around the world that advance the University’s mission of “knowledge in service to society.” Finally, about 30% of undergraduate men and about 40% of undergraduate women participate in one of the 39 recognized fraternity and sorority chapters here at Duke. Duke’s legendary Division I athletic teams compete in the Atlantic Coast Conference, supported by equally legendary fans. Duke has won national championships in men’s basketball (1991, 1992, 2001, 2010, 2015), men’s soccer (1986), men’s lacrosse (2010, 2013, 2014), women’s golf (1999, 2002, 2005, 2006, 2007, 2014), and women’s tennis (2009). Duke also fields 36 sports clubs and numerous intramural teams. Duke is committed to a need-blind admission policy for US citizens and permanent residents, which means it admits undergraduates without consideration of their families’ abili-ty to pay tuition and other college costs and meets 100% of students’ demonstrated financial need for four years. About 50% of all Duke students receive some form of financial aid, which includes need-based aid, athletic aid, and merit aid. The average need-based grant is more than $50,000. For more information, visit financialaid.duke.edu.